History: (What If? II#112 (fb)) - When Parnival Plunder stole the Savage Land Terraformer for Thanos and used it in Manhatten, New York was transformed into a new Savage Land. Before Ka-Zar and Shanna the She-Devil could stop Parnival, Parnival destroyed a medallion that would allow them to stop the Terraformer and escaped. As the Terraformer caused plant life to consume New York, the recently-returned heroes of Earth were unable to stop it, leaving villains Plantman to roam free in a city filled with vegetation. (What If? II#112) - Five years later, as Shanna the She-Devil patrolled the jungle-filled New York, she came across a rampaging tyrannosaurus. 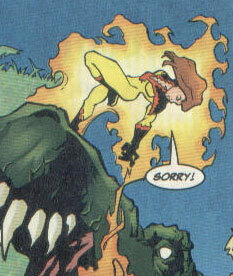 The Avengers had already arrived to subdue the dinosaur, but Shanna jumped down to help them out. After Hawkeye missed a shot at the tyrannosaurus, he was shocked to see the dinosaur fall despite his missed shot. The Avengers and Shanna were surprised to see the arrival of Ka-Zar, wearing the skull and pelt of his fallen sabretooth tiger, Zabu. As Shanna and Ka-Zar shared a reunion that had been months coming, Agent Orange pointed out that the 2 Flare had just went up over the West Side of New York. Hawkeye then announced that the Fantastic Duo needed the Avengers' help and the Avengers made their leave, with Frank Castle informing Ka-Zar that he owed it to his son to never stop trying to make the world a better place. After the Avengers left, Ka-Zar and Shanna began to argue about whose fault it was that New York was a jungle until Ka-Zar's brother, Parnival, interrupted their bickering. Parnival explained that they had much to discuss and he led both Ka-Zar and Shanna to his hidden base. Once inside, Ka-Zar threatened to kill Parnival until Parnival explained that they needed his help to restore New York. Parnival, being the hypochondriac that he was, explained that his hidden base was about to run out of provisions and fresh air and that he needed Ka-Zar and Shanna's help to restore New York to its past state. He then told Ka-Zar about how Thanos had duped him into helping him five years ago and how he had rigged the Terraformer with explosives in case Thanos didn't hold his end of the bargain. Ka-Zar and Shanna agreed to help detonate the explosives manually, but Parnival had to join them in their quest to do so. On their way to the Terraformer, the trio was attacked by the Rhino, who wanted revenge against Parnival for promising to make him intelligent if he killed Ka-Zar. 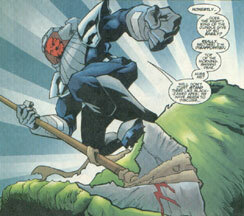 Rhino's rampage was interrupted by the arrival of the Avengers, who battled with Rhino while Ka-Zar, Shanna, and Parnival continued their quest towards the Terraformer. The trio made their way into the subway system, where they were attacked by a pack of velociraptors. Escaping the raptors, the trio found the technological epicenter of the Terraformer and upon entering it, activated a deactivation sequence. Parnival explained to the others that they had three minutes to detonate the explosives or the destruct system would go offline forever. He also informed them that two of them must die in order to destroy the Terraformer, as two people had to turn two keys simultaneously in order to manually detonate the explosives. Parnival then attempted to force Shanna and Ka-Zar to be the keyturners, but Ka-Zar announced that Parnival would atone for his own mess, and that he and Parnival would be the keyturners. Parnival agreed to be a keyturner, given that his other choices were to live in a filthy city or a deep jungle. Ka-Zar then gave Zabu's skull and pelt to Shanna to ordered her to run. Just as Shanna made her way out of the subway, the Terraformer exploded, knocking her out. Twelve hours later, she awoke to New York as it used to be and then noticed that the Queensboro Bridge now led the way into another jungle outside of New York. She then realized that Thanos had not just transformed New York, but perhaps the entire country or the Earth itself. Comments: Created by Brian K. Vaughn, Coy Turnbull, Keith Champagne, and Ray McCarthy. 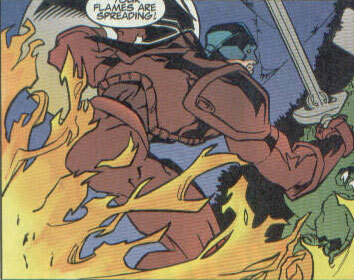 Agent Orange was a member of the Avengers who could project flames. She accompanied the team against the tyrannosaurs and to aid the Fantastic Duo. She later joined them against to Rhino to help buy time for Ka-Zar, Shanna the She-Devil, and Parnival Plunder to destroy the Terraformer. 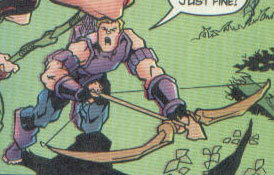 Hawkeye was the same old wise-cracking Avenging Archer, with the exception that he now led the Avengers using a homemade bow and arrows. Tony Stark was still active as an Avenger in the jungle-ridden New York with his own suit of armor. He also wielded the Black Knight's sword and Captain America's shield, suggesting that the two heroes might have fallen during the five years that New York had been a jungle. When Ka-Zar failed to stop Parnival Plunder from destroyed a medallion that would allow him to stop the Savage Land Terraformer, New York was transformed into a duplicate of the Anarctic Savage Land. After years of fighting to preserve New York, Ka-Zar went into exile while trying to find his missing son, Matthew. 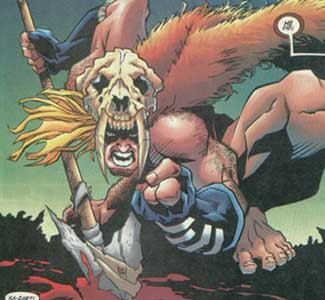 In the course of trying to find his son, Ka-Zar lost his sabretooth companion, Zabu. Returning to New York, Ka-Zar reunited with Shanna in time for his brother Parnival to recruit them in helping to destroying the Terraformer. Once he, Shanna, and Parnival arrived at the Terraformer, Parnival explained that two of them had to turn safety keys in order to manually detonate explosives that he had set on the Terraformer. Ka-Zar forced Parnival to be a keyturner and sacrificed his own life to turn the other key, dying in the ensuing explosions. Ororogue was formerly known as the X-Man Rogue, only somehow she had permenantly absorbed Storm's powers and memories. After New York was transformed into a jungle, Ororogue joined the Avengers. 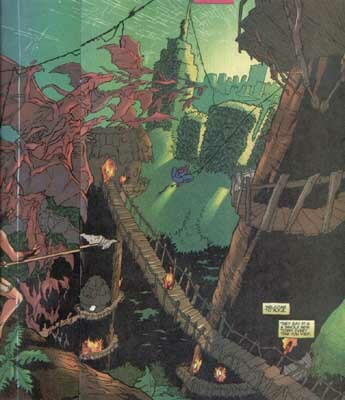 After Parnival destroyed a medallion that would allow Ka-Zar and Shanna the She-Devil to prevent New York from transforming into a jungle, he went into exile in his own hidden base for five years. When his provisions and clean air began to run out, he confronted Ka-Zar and Shanna, explaining that he had rigged the Savage Land Terraformer with explosives that needed to be detonated manually. He then led Ka-Zar and Shanna to the Terraformer, where he informed them that two people had to stay to turn the manual keys. Ka-Zar then forced Parnival to be a keyturner to atone for the mess he had caused. Parnival agreed and as he turned his key, he commented to Ka-Zar that his dad had always like him better. Parnival then perished in the ensuing explosion caused by the explosives. 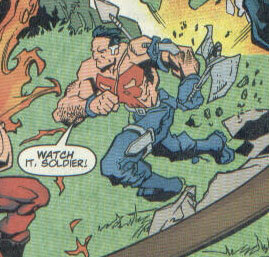 After New York was transformed into a Savage Land, Frank Castle joined up with the Avengers in an effort to make the world a better place in his own violent way by killing dinosaurs. He soon became the Avengers' conscious, explaining to Ka-Zar that no matter what, Ka-Zar owed it to his son to help make the world a better place. Frank used many sharp bones and knives instead of guns as an active Avenger. After New York was transformed into a Savage Land, Shanna and Ka-Zar fought to preserve the city until Ka-Zar disappeared on a quest to find his son, Matthew. Shanna then started a quest to find her husband. During a battle where Shanna teamed with the Avengers against a tyrannosaurus, Ka-Zar returned to Shanna and they shared a very brief reunion until Parnival Plunder arrived. Parnival informed the duo that he knew how to change New York back to its former state, but he needed the help of both of them to do so. Shanna and Ka-Zar agreed and Parnival led them to the Terraformer, where he announced that two people needed to stay behind to detonate the explosives he had placed on the Terraformer. Ka-Zar agreed to sacrifice his life and ordered Parnival to do the same. He then ordered Shanna to run and Shanna barely made it out of the subway tunnels of New York before getting knocked out by the ensuing explosions. When she awoke twelve hours later, she discovered that New York had indeed been transformed back its original state, but then noticed that the surrounding areas were still consumed by jungle, leading her to believe that when Thanos transformed New York, he also transformed the entire Earth.